The NASA CFD Vision 2030 Study (the Study) presents an assessment of the current state of the art in applied computational fluid dynamics (CFD), and provides insight into requirements decades into the future. Mesh generation is a key component in the CFD process with several challenging obstacles to be overcome in order to deliver the Study’s required capabilities by the year 2030. As the Study describes, the majority of recent advancements in mesh generation technology have come from commercial vendors due to reduced government investment in this area. Therefore, we describe herein a commercial software vendor’s perspective on future mesh generation requirements in response to the Study. As a commercial software vendor, the focus of research and development is strongly customer driven, balancing both near- and long-term needs. Some aspects of the Study pertain to capabilities that are needed near term, such as improved geometry model preprocessing and mesh adaptation. These two near-term aspects can be intertwined as mesh adaptation near or on geometry model surfaces must preserve the geometry model’s true shape. Anticipating customer needs drives long-term development priorities. Recently, Finite Element Methods (FEM) using curved, high-order (HO) meshes have been developed for CFD with estimates that within a decade such techniques will be widely used in production environments. Finally, the Study’s goal of making mesh generation invisible to the customer is the most obvious long-term development priority. All CFD analyses begin with a geometry model. This model can be created using a myriad software tools and delivered in a multitude of representations and formats. Meshing software must be able to properly import and process the geometry model to provide a robust starting point for mesh generation. The Study takes geometry interoperability beyond mesh generation by citing the CFD solver’s need for geometry access. Ideally, the geometry model should be persistent throughout the CFD process if the goal is to ultimately perform mesh adaptation, HO mesh generation, and shape optimization. This requires all software components to have access to, and the ability to interact with, the geometry model. Several good geometry kernels exist, both commercial and open source. For CFD, however, the geometry kernel must be lightweight and provide the CFD software with efficient evaluations of quantities of interest such as point, tangent, normal, and curvature. We are currently working to deliver an Application Programming Interface (API) to a lightweight version of the geometry kernel used in Pointwise. A geometry kernel for simulation solves only part of the problem. To address the lack of an explicit linkage between the mesh and geometry, a strategy is required to provide the associativity robustly, compactly, and efficiently. An aspect that is unique to commercial software is the requirement to export meshes to a wide variety of file formats. For example, Pointwise currently includes export interfaces to over 60 file formats and also provides a plug-in software development kit (SDK) for customers to add their own exporters. Therefore, the mechanism by which mesh and geometry model are linked needs to accommodate all these downstream users. Beyond the issue of file formats is the issue of encapsulating the many-to-many associativity of mesh to geometry. At Pointwise, mesh-geometry associativity is to be addressed by a schema to be delivered within the aforementioned geometry kernel. For a fully automated CFD process, the mesh must be adapted as the solution evolves. A priori mesh generation – even including best practices – can only take us so far. Some adaptation methods compute gradients of scalar quantities (density, for example) and decrease mesh size where gradients are large. Other methods use adjoint formulations to determine mesh spacing requirements in response to an output function such as lift or drag. Adjoint methods are far more mathematically rigorous and require substantial investment in solver technology. An example of our work on mesh adaptation is shown in Figure 1 for a viscous solution about an ONERA M6 wing. 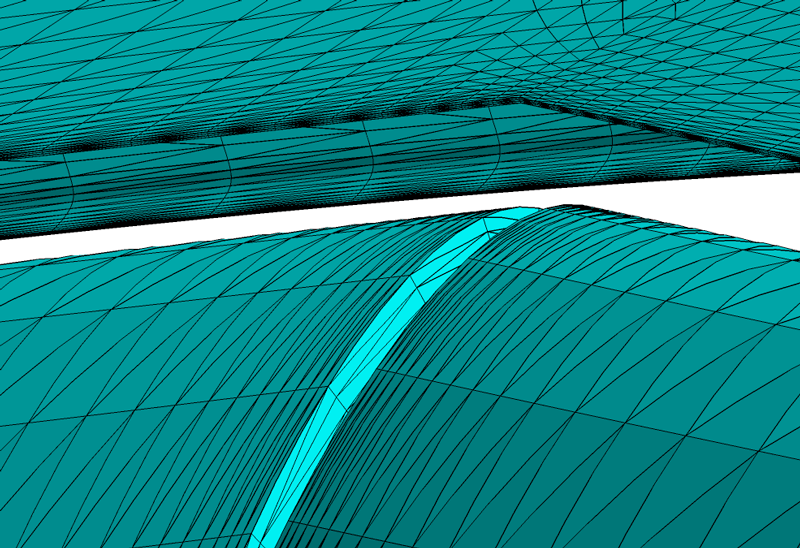 Figure 1: Adapted mesh at a spanwise location on the ONERA M6 wing using the adjoint-based approach in FUN3D. The key to performing mesh adaptation is in the definition of the spacing field. Once spacing requirements are known the actual mesh refinement, coarsening or repositioning can be performed. Certain regions of the mesh are more challenging to adapt than others. For example, a prismatic mesh resolving a boundary layer is one example where a restricted adaptation operation may be imposed in order to retain the quality afforded by the prism layers’ semi-structure. Use of FEM in CFD has been evolving rapidly in recent years. The numerical methods can now handle more complicated physics, including shock waves and high Reynold’s number flows with turbulence. Linear meshes can be analyzed with FEM CFD solvers to achieve second order spatial accuracy, but a higher accuracy can be achieved by elevating the polynomial degree of the mesh elements. Large mesh elements constrained to the geometry model can become highly curved when elevated to higher degree. This high curvature can invert neighboring elements. The most important aspect of generating an HO mesh is the blending of the curved surface elements onto the mesh’s interior to avoid inversion. Without this step, generating HO meshes for real-world geometries is virtually impossible. We generated a series of meshes ranging from linear to quadratic and cubic for the NASA High Lift Common Research Model Wing Body used in the 3rd AIAA CFD High Lift Prediction Workshop. The HL-CRM-WB contains a leading-edge slat and two trailing-edge flaps. The surface mesh in the flap-gap region of the cubic mesh is shown in Figure 2. Figure 2: Cubic, high-order surface mesh for the NASA HL-CRM-WB near the gap between the inboard and outboard flaps. The Study’s vision of CFD in the year 2030 is hands-off and automated. To realistically approach that goal, many mesh generation functions need to be modularized and available in an HPC context. In the same way that geometry modeling functionality can be added to CFD with a geometry kernel, a similar result can be achieved with a mesh kernel. Several of the more important functions in such a kernel are smoothing, viscous mesh extrusion, hexahedral-dominant meshing, and Delaunay meshing. These are briefly described below. Mesh smoothing plays an important role in many meshing operations. Yet not all methods can ensure quality, validity, or clustering of the mesh. Unstructured smoothing methods include spring analogy, linear-elasticity, Winslow’s method, and weighted-condition-number. Smoothing meshes by using a spring analogy is the most prevalent approach used in unstructured meshes. Because most implementations of spring analogy smoothing cannot robustly control tightly clustered viscous meshes near solid walls, they are typically relegated to the isotropic regions of unstructured meshes. The most common smoothing method applied to mesh adaptation and HO mesh generation is linear-elastic (L-E) smoothing. L-E smoothing employs the linear-elastic equations from structural mechanics with a modified Young’s Modulus to impose stiffness to mesh elements in regions like the boundary layer. When applied to a moving boundary problem or a refined linear mesh it can be very successful. However, L-E smoothing can be problematic when used with HO meshes near curved boundaries, as no strict enforcement of the normal spacing is imposed and element inversion is possible for the most difficult cases. Winslow smoothing is commonly used in structured grid generation and is applicable to static and moving meshes. It affords a high degree of control over the mesh smoothness, spacing, and quality. Yet, Winslow smoothing is rarely used in unstructured mesh generation due mainly to a major flaw; there is no reliable and robust way to define a global computational mesh on which the method can be applied. This remains an area of active research. HO mesh generation offers an opportunity to apply Winslow smoothing since the curving process can use a copy of the linear mesh as the computational mesh. Weighted-condition-number (WCN) smoothing perturbs mesh points incrementally to improve a cost function. Originally implemented for isotropic tetrahedral meshes, we have extended it to work on adapted, extruded, and HO meshes. For the latter, the HO mesh elements are subdivided into collections of linear sub-elements. The WCN smoothing of all interior nodes is achieved by enforcing the shapes of the linear sub-elements. WCN smoothing has been used to create numerous HO meshes on simple and complex geometries. The predominant method used to create clustered meshes in viscous regions is normal (orthogonal) extrusion. The volume mesh is grown away from the geometry model in the normal direction following a prescribed growth rate. Extrusion terminates when the extruded elements reach an isotropic shape, element quality falls below a threshold, or when a collision with another extrusion front occurs. This is a powerful and robust method for generating the anisotropic elements needed to resolve the viscous gradients near the surface and is the basis for Pointwise’s anisotropic tetrahedral extrusion (T-Rex) technique. An alternative to isotropic tetrahedral volume mesh generation is the use of hexahedral meshes. These meshes are rapidly generated and can accommodate solution adaptation requirements. Currently, they are most popular in non-viscous applications. The treatment of geometric boundaries is typically handled using arbitrarily cut cells or boundary embedding techniques can be used. These meshes can also work in conjunction with extruded viscous meshes. Work recently completed at Pointwise on hexahedral mesh generation is being extended to couple with the T-Rex technique described above, which itself was recently extended to support extrusion of hexahedral layers. The resulting mesh envisioned from this technique would have layers of hexahedra in the boundary layer, a hexahedral mesh in the farfield, and a tetrahedral mesh stitching the two together. Probably the most important module is the triangle and tetrahedral mesh generation module. It will have applicability in several areas from generating the entire isotropic mesh, creating the stitch mesh in the hybrid scheme just described, and performing mesh topology optimization in an adaptation pass. The Study describes the mesh generation process as a bottleneck and a dominant cost in terms of human intervention. Progress must be made to automate much of the mesh generation phase of the simulation. Scripting is an integral component of automated mesh generation. Pointwise, like many commercial tools, has a scripting language that users apply to repetitive operations such as macros. Some scripts are sophisticated meshing templates that allow the entire meshing process to occur automatically. Best practices are usually built into these scripts. If one assumes the starting point for automated mesh generation is a water-tight geometry model, then fully automated mesh generation is possible today using Delanuay techniques. A next step, not currently a standard practice, would be to add symmetry planes and outer boundaries to the geometry model. A complete solid geometry can be constructed that defines the fluid domain of interest. Existing tools could mesh this solid and the CFD solver could compute and adapt the mesh. The example above presumes a highly automated and robust meshing algorithm such as the Delaunay technique and an entirely tetrahedral mesh. The mesh generator could theoretically generate a more suitable mesh with boundary layer resolution for a viscous simulation if it had knowledge of where those surfaces were and the flow field parameters (for example, Mach number). Because the case was made above to have persistent geometry, the CFD process should take advantage by attaching meta-data to the geometry. Efforts are underway at Pointwise with researchers at MIT and Syracuse University to explore the creation of a general automated mesh generation process. The geometry model in this case will be provided by ESP and attributed such that the meshing software can generate the mesh fully automatically in a way that is fit for the customer’s particular purpose. 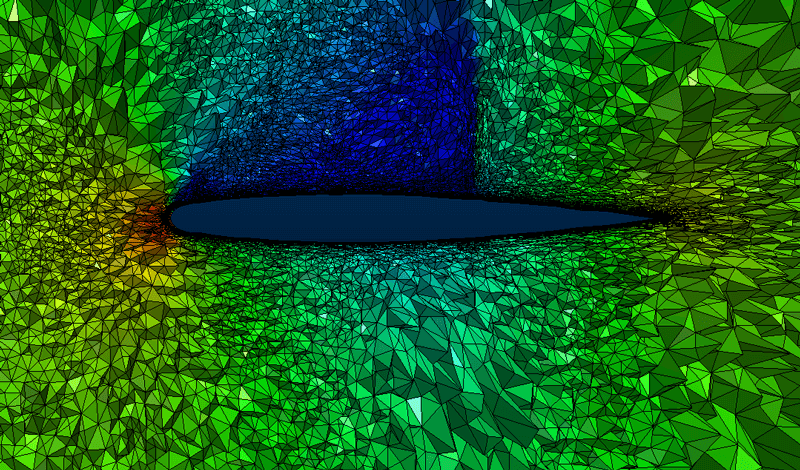 Pointwise views the NASA CFD Vision 2030 Study as an important document that provides focus for research into the CFD and mesh generation processes. Key to solving many of the challenges is geometry. Beyond the traditional challenges of interoperability and suitability, mesh-geometry associativity and access to geometry throughout the entire CFD process must be enabled. Commercial mesh generation software vendors must offer software tools that add value to the engineering process. As the engineering process evolves with more complicated geometry, physics, and analysis capabilities the mesh generation tools must also evolve in coordination with the other analysis tools. The investments made by the commercial vendors should be aligned with research funding in academia and government. The challenges are too great to be attempted in isolation. Collaborative efforts will accelerate the progress toward automated, intelligent mesh generation. This article is an abridgement of the paper “Mesh Generation Challenges: A Commercial Software Perspective,” by Steve Karman, Nick Wyman, and John Steinbrenner, AIAA paper no. 2017-3790, presented at AIAA Aviation Forum 2017 in the Special Session “Capabilities and Challenges in CFD I: Academia, Government, and Industry Perspectives.” See the full paper for references to all supporting materials.